The DEN Virtual Trifeta Begins Today! Digital teaching methods and tools. 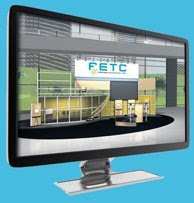 Technology product and service demonstrations. Join us tomorrow, April 24, 2009 at 8 PM EDT for the ribbon cutting ceremony for our new DEN headquarters in Second Life.Our new DEN headquarters is a virtual replica of Discovery’s World Headquarters in Silver Spring, MD – complete with the HD theater and the T-Rex. Put on your virtual dancing shoes and come celebrate with us! No, it’s not a tech toy! LOL It’s the revised link to the New DEN in SL HQs. Make sure to save this as a Landmark once you’re inworld! Visit the DEN Second Life blog for more details and for information about upcoming in-world sessions. Great news: DEN in SL has finally joined the social networking craze. You can follow the antics of the DEN in SL by following SLDENLC. If you want to get SLsattention, you can always add at the beginning of your Tweet ‘@SLDENLC’. Yes, folks, that would be @SLDENLC. 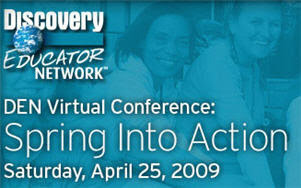 If that isn’t enough in-world, you can Spring into Action virtually or live Saturday, April 25, 2009 – 9 AM to 3 PM EDT. You can check out the schedule here. As always, Discovery delivers the best professional development while connecting us to our best resouces, each other. Hope to “see” you at the DEN Trifecta! Special thanks to NY, SL, and Dorman Travailles blogs for allowing me to cobble a composite blog post.